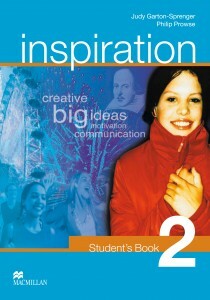 The Student’s Book interweaves a strong skills syllabus with motivating topics and activities. The progression of the course evolves with the students, reflecting their changing needs and interests. The Workbook follows the structure of the Student’s Book with a wealth of additional exercises, including brainteasers, crosswords, a unit-by-unit story for extensive reading and suggestions for further reading and follow-up work on the internet. The Teacher’s Book brings lots of fresh new ideas to the classroom with numerous suggestions for warmers, optional activities and follow-up activities. It also includes additional cultural information to answer those difficult questions. All the dialogues, texts, pronunciation exercises, songs and sketches in the Student’s Books are recorded and available as listening material on the class audio CDs. Recorded items are indicated by a headphones symbol in the Student’s Book and Teacher’s Book. Inspiration Builder is a teacher’s resource pack with additional photocopiable material to practise the target language. It provides a wealth of extra material to supplement the course with a range of activities to suit different learner styles. 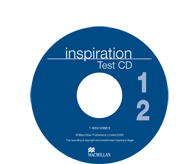 These editable test CDs include 24 short tests on grammar and vocabulary, 8 medium-length tests on language and integrated skills for the whole unit, a placement test, mid-course tests and end-of-term tests. Each CD covers two levels. The Inspiration Companions are available in Dutch, French and German. They contain the key vocabulary of every lesson with prounciation, translation and sample sentences. There is also a Vocabulary Extra! section with audio CD which provides listening activities to consolidate key words and phrases. For more information on these companions, please contact your local sales representative.